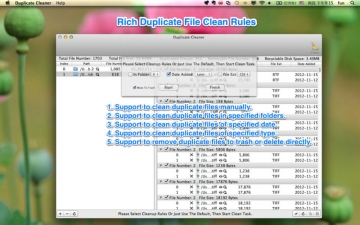 Duplicate Cleaner - find&clean duplicate files | Mac App Storeのアプリ検索・ランキング BuzzMac! 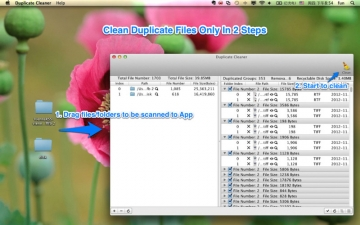 A very easy-to-use duplicate file cleaner. 1. Drag folders/files to the left panel, it will start to scan automatically, and show the scanning result in the right panel. 1. Original file scanning policy + Improved MD5 algorithm = 100% Accuracy of the duplicate detection + Very fast scan speed. 2. Support manual file clean and batch file clean. 3. Rich options to specify which files to be scanned and which to be cleaned. 4. Support file recovery, avoid the loss of mis-operation. 5. Support files/folders drag&drop, support to sort files. 6. Support exclude filter to skip specified folders when scan. 1) Drag the folders or disks you want to clean to the left pane of the App, then the app will start to scan duplicates automatically. 2) Please wait the scan to finish, then you click "Clean" button in the toolbar, it will show you a panel to choose which files to clean. 3) Click "Start" button and wait the clean task finish, then you can click "Done" button to quit. For step 2, I recommend you choose "Move To Folder" because this option supports file recovery, if you find something wrong, you can click "Undo" button in the toolbar to put all deleted files back. 2. Why some file scan is relatively slow? A: If several huge size files have very little difference, in order to ensure the accuracy of the scan, the scanning speed of these huge files will be relatively slow, it is expected. if you don't want to scan certain type of files , you can skip them from preference to save some scan time. And you can also try to enable fuzzy matching mode to speed up the file scan. 3. How to do file recovery? 2) After batch clean duplicates, the deleted files will be moved to the target folder, you can click "Undo" button from the toolbar to recovery deleted files. 3) Please note, only batch clean support file recovery. and if you quit the app, the deleted files CAN NOT be recoveried. 4. What's "Speed up mode"? A: It aims to speed up the large file scanning, this mode is very useful for large binary file format, such as movies, pictures, zip files and etc. but the result is not 100% accurate, you should double check the result before clean them.